By the time Slipknot hit the spotlight, after some pre-headliner encore awkwardness from Marilyn Manson, Downsview Park was an endless sea of mud. Even the wood-chipped areas in front of the stages were a squelchy mess. Throughout the long, wet and mucky day, Slipknot shirts had been fairly prominent in the crowd, and a few fans even showed up in band-inspired costumes; now was their time to dance in the puddles around stage west, and dance they did. The noisy crew from Iowa came out in the requisite red coveralls and masks to a flash of bright lights, delivering oldies like "Eyeless" and "Wait and Bleed" pretty early in their set. 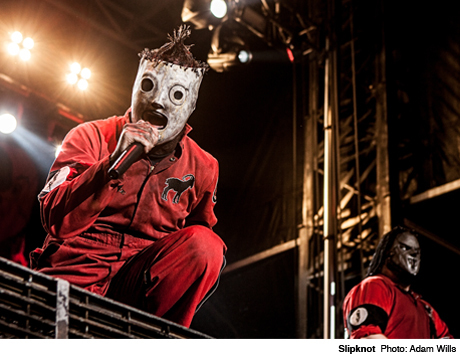 Aside from the flashiness, the main spectacle was mostly handled by vocalist Corey Taylor (No. 8) and a pair of frontline percussionists, showing off toys like elevator risers and favouring heavy artillery (like a baseball bat) for hitting the drums.